An observed trend in social engineering attacks is the complex and compelling nature of the engineered lure specifically targeted and sculpted for the victims using gleaned sensitive information. Recent successful exploits resulting in large data breaches of sensitive information have contributed to a premium of available, exploitable information. Sensitive information is also readily available on corporate websites, and social media platforms such as Facebook, Twitter, LinkedIn, and others. This availability of information dramatically increases the occurrence, sophistication, and success of follow-on social engineering attacks. Clever and convincing lures tailored to the targeted individual or organization can be created by even the most unsophisticated criminal actor. Another observed change in social engineering tactics is its inclusion in crime-as-a-service. An example of this is the tool created by China’s underground cyber-crime economy, called “Social Engineering Master”. The tool provides access to leaked or stolen information in order to create a persuasive social engineering attack against a specific victim or group of victims. According to Eweek, Chinese cybercriminals developed this tool and it is being sold for approximately $50 on the underground market. Christopher Budd, a manager with Trend Micro, suggests that Chinese cybercriminals are becoming more sophisticated by offering services such as “Social Engineering Master”. McAfee released a 2015 study, “Hacking the Human Operating System, The Role of Social Engineering within Cybersecurity” which discusses the role of social engineering within cybersecurity, the lifecycle of a social engineering attack, and the psychological lures which realize the most success for attackers. 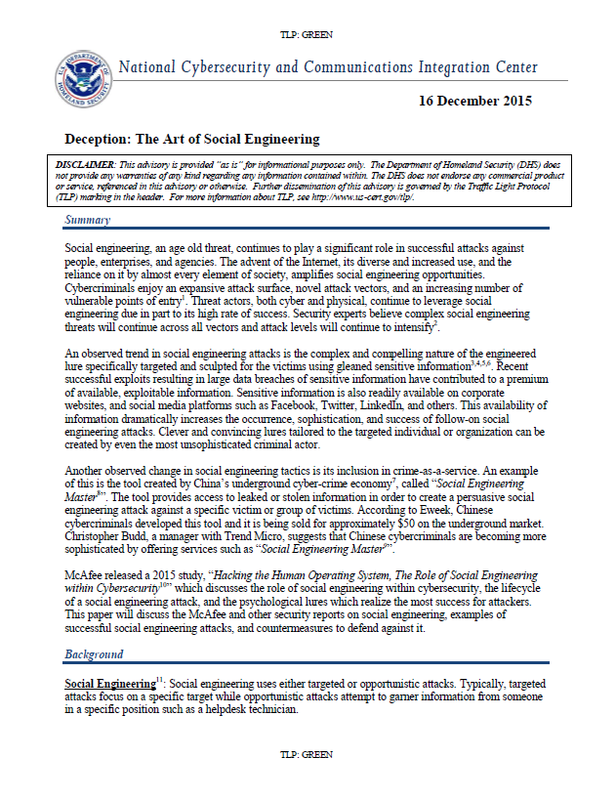 This paper will discuss the McAfee and other security reports on social engineering, examples of successful social engineering attacks, and countermeasures to defend against it. 1. Research is used to garner information that may assist in identifying and compelling the target to observe an unsafe practice. The Internet allows cybercriminals to remotely conduct open source research using websites, social network profiles, public documents, and other available resources. Some of the information sought includes phone numbers, Internet Service Providers (ISPs), addresses, and other publicly available information. In addition to online research, attackers may socialize or physically interact with the target. In opportunistic attacks, the actor may conduct little to no research. 2. Hook is when cybercriminals attempt to compromise targeted individuals or groups. Robert Cialdini discusses in “The Psychology of Persuasion” six possible “levers” that can be used to hook the targeted individual or group. The influencing levers are reciprocation, commitment and consistency, social validation, like-ability, authority, and scarcity. This is the phase where the attacker involves the target, creates the spoof, builds trust, and compromises the target. 3. Play is the extraction of information and maintaining control of the situation. This phase is where the user clicks on the malicious link, provides personal or financial information, or pays money. Sometimes the hook and play phases occur simultaneously. 4. Exit is closing the link with the targeted victim and completing the scam without arousing suspicion. Tailgating or “Piggybacking” – A form of social engineering involving someone who lacks the proper authentication and authorization who follows another person into a restricted area. An example of a tailgating attack is when a person impersonates a delivery driver and waits outside a building. When an employee gains security’s approval and opens the door, the attacker asks that the employee hold the door, thereby gaining unauthorized access to the building.